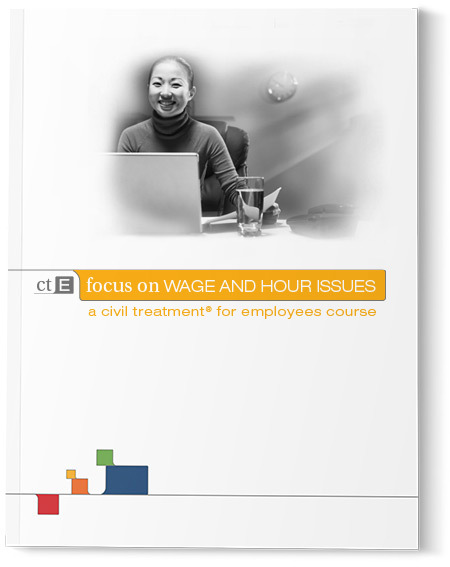 Civil Treatment for Employees (CTE): Focus on Wage and Hour Issues educates participants about the Fair Labor Standards Act (FLSA). This course explores the FLSA guidelines that employees must know in order to understand the wage and hour issues they may encounter in the workplace. Using the Timeminders™, a concrete and memorable set of guidelines, participants learn how to comply with organizational standards and the law. In addition to the FLSA, the course allows employees to study their individual organization’s wage and hour policies as well. This course uses videos, interactive maps, brief vignettes, and exercises with immediate remediation and reinforcement to help participants practice applying the FLSA to a variety of wage and hour issues that pose significant risks to an organization’s and employee’s compliance with the FLSA. 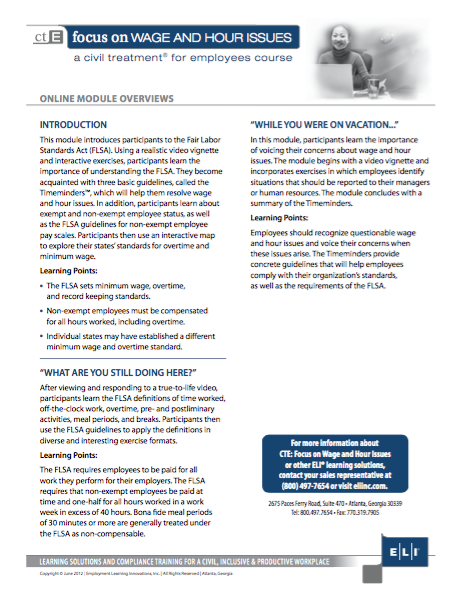 Through this learning solution, employees learn to follow the mandates of the organization and the FLSA to resolve wage and hour concerns successfully. CTE: Focus on Wage and Hour Issues covers Fair Labor Standards Act requirements that help employees identify and resolve wage and hour issues. CTE: Focus on Wage and Hour Issues is a 30-minute online course.